OUR PART-TIME COURSES ARE ADDRESSED TO THOSE WHO DO NOT HAVE THE OPPORTUNITY TO FOLLOW AN ENTIRE UNDERGRADUATE EDUCATION PROGRAMME, BUT ARE STILL EAGER TO IMMERSE THEMSELVES IN ALL THINGS TO DO WITH FASHION. Enrol for one of the Amsterdam Fashion Academy’s much coveted part-time courses starting soon. 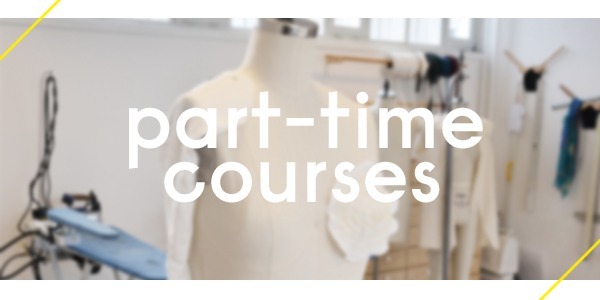 We offer a wide range of part-time courses covering different topics for those interested in fashion design and business. The part-time courses give you the chance to study one day a week for three months. For these courses a study visa is not required. Our excellent, enthusiastic lecturers are only too happy to share their high-quality fashion knowledge along with their experience in the international fashion industry. These are passionate, qualified professionals with many years fashion industry experience, rooted in the international fashion industry, who will be passing on their first-hand knowledge and experience to you. We are proud of our small classes which give a high level of personal attention in an extremely creative environment. So take advantage of this once in a life-time opportunity. Don’t miss the boat! Our teaching staff is not only enthusiastic, supportive and accessible, but is also given the time and space required to adapt to the specific learning needs of individual students.